Biofinity Toric lenses for the correction of astigmatism are available in packs of six lenses. They have an exceptionally high level of oxygen permeability and water content and are approved for extended wear. Biofinity Toric contact lenses are intended for the correction of higher levels of astigmatism. 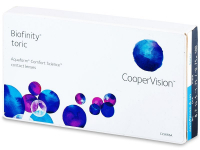 These lenses have a monthly replacement schedule and are produced by CooperVision. Thanks to their balanced values of water content and oxygen permeability, Biofinity Toric lenses are also suitable for extended wear for up to seven days and six nights. Before wearing overnight, consult with your optometrist. This package contains six lenses. 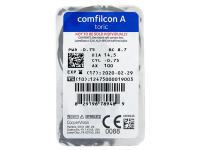 Read more about Biofinity Toric contacts. Great toric lenses. My eye doctor told me that I'm able to wear these overnight so it's good to be able to put these in and forget about them. When they get a little dry after a long day at work, I just use some eye drops and they're good as new again. Are biofinity toric monthly lenses or fortnightly? I've seen some conflicting information online. Thx for clarifyig. Hi Shaznab, the manufacturer, CooperVision, recommends that the Biofinity Toric replacement schedule is every 30 days. Best prices for my most trusted lenses. High quality and prompt delivery.